I originally came across a list like this some years ago. It was a list of the top 50 foods from around the world. But I must say I did not agree with this list at all. It is difficult as tastes and preferences vary so much from person to person. 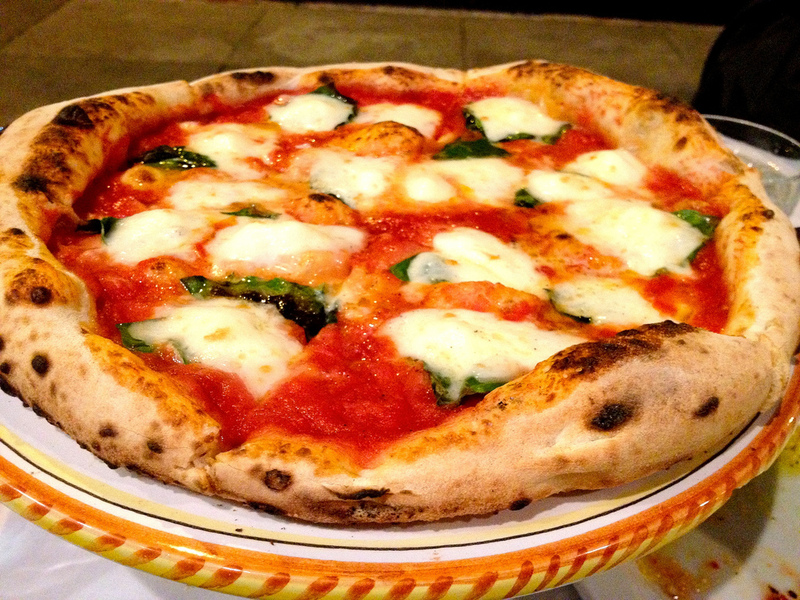 This is my Top 10 Best Foods in the World list. If you would like to view the top 50 list I spoke about above, follow this link. POKE is diced raw fish and is one of the main dishes in native Hawaiian cuisine. The name poke (poʊˈkeɪ) means to slice or cut in pieces. Tradionally poke is ahi or salmon tosed in soy sauce, sesame oil, onions and sesame seeds. Over the years chefs have got very inventive with poke dishes. Poke bowls are often served, starting with scented rice, then the poke and topped with different vegetables such as avocado, beetroot, seaweed etc. SHISH KEBAB is a popular meal of skewered and grilled cubes of meat. The name shish kebab comes from the Turkish word şiş meaning sord or skewer and the Turkish wordkebap meaning roasted meat dish. Traditionally the shish kebab was made with lamb. These days this dish is found all over the world using different meats, marinades and combining vegetables on the skewers before grilling. A taco Spanish: [ˈtako]) is a traditional Mexican dish consisting of a corn or wheat tortilla folded or rolled around a filling. A taco can be made with a variety of fillings, including beef, pork, chicken, seafood, vegetables, and cheese, allowing great versatility and variety. Tacos are generally eaten without utensils, often garnished with salsa, chili pepper, avocado, guacamole, cilantro (coriander), tomatoes, onions, and lettuce. There are some creative taco versions made today, some using hard shell tortilla, filling are getting very inventive such as ahi tuna tacos. PIRI-PIRI Chicken is a spicy dish and refers to grilled (or roasted) chicken marinated in a sauce flavored generously with bird’s eye chilies. The dish was created in Mozambique when the Portuguese settlers arrived with chili peppers (known as piri-piri in Swahili). Piri-peri also known as ‘African Birds Eye’ is key to marinating the chicken. Many say it is a fusion of Mozambican and Portuguese cuisines, Mozambique having been ruled by the Portuguese for over 400 years. There are so many ways to prepare the marinade for piri piri chicken but the basic ingredients, aside from bird’s eye chilis, are oil (olive oil or butter), garlic and salt. Vinegar or lemon juice is often added although it is optional. Thank you Japan for this dish, delicious to eat, a mission to make! Sushi is a Japanese dish, but the term sushi no longer fits the dish as literally mean ‘sour-tasting’. Sushi is made with a layer of vinegared rice, with a variety of ingredients placed on top such as seafood and vegetables, this is then rolled and sliced. Sushi is commonly served with soy sauce, wasabi and fresh ginger. The increasing popularity of sushi around the world has resulted in variations typically found in the Western world, but rarely in Japan, such as the ‘California roll’. Lasagna did not originate in Italy as you may expect. Its origin can be traced way back to Ancient Greece. 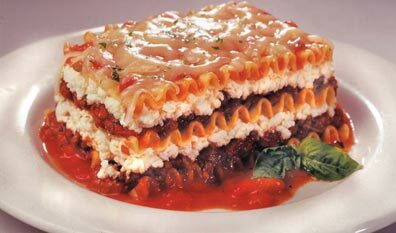 The name Lasagna, or “Lasagne” is derived from the Greek word ‘Laganon’; the first known form of pasta. Italy claims they were the first, but really should be credited for perfecting the layers and layers of deliciousness that is lasagna. Modern day lasagna, the richly layered dish swimming in sumptuous tomato sauce, made its debut in Naples, Italy, during the Middle Ages. Valencia in Eastern Spain is the undisputed home of paella. The word ’paella’ or to be more exact ‘la paella’ is the name for cooking pan itself and not the dish. This is the dramatic seafood dish that looks stunning, with crustaceans and shellfish. You can vary the quantities of seafood and also use crab, crayfish, or lobster. Today adding meat and vegetables to seafood paella has become common. Traditionally the seafood is served on a bed of saffron rice and dished ‘family ‘ style. 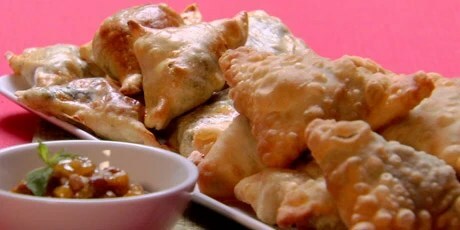 The samosa is claimed to have originated in the Middle East (where it is known as sambosa) prior to the 10th century. Samosas were introduced to the Indian subcontinent in the 13th or 14th century by traders from Central Asia. The samosa contains Wheat flour shell stuffed with some filling, generally a mixture of mashed boiled potato, onions, green peas, spices and green chili. The entire pastry is then deep-fried to a golden brown color, in vegetable oil. It is served hot and is often eaten with fresh Indian chutney, such as mint, coriander or tamarind. Today, samosa is a popular snack in many parts of the world. Perhaps its biggest secret to popularity and survival over the centuries is its different varieties of fillings catering to carious tastes across the globe. The Wiener Schnitzel is the national dish of Austria. 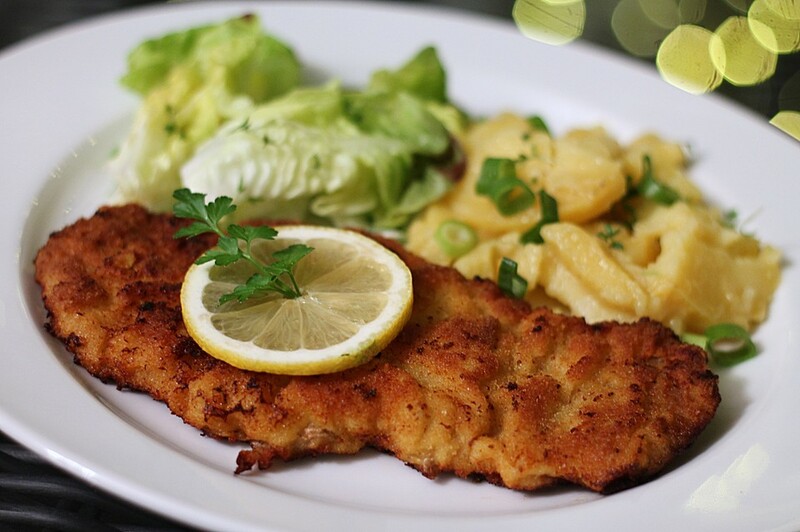 A Wiener schnitzel is a 3-6 ounce thin slice of veal covered with crumble which is fried and can be served with a lemon slice or with potato salad, French fries, buttered boiled potatoes or with jam. ‘Wiener’ this word comes from the word ‘Wien’, which is the Austrian city called Vienna. ‘Schnitzel’ means basically meat in a crust. A popular variation is made with pork instead of veal, because pork is cheaper than veal.